For the first time ever, the NCAA decided to hold the Division II and Division III national championship games that same weekend, as part of the anniversary celebration, in the Final Four host city. c21’s research indicated typical attendance for the DII and DIII championship games was ~1,500 – 2,000. Seating capacity for 2013 venue was 10,000. 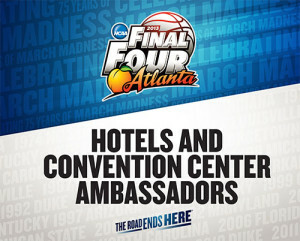 Ultimately, we needed to ensure the student-athletes did not play in an empty arena, and had a true Final Four experience. 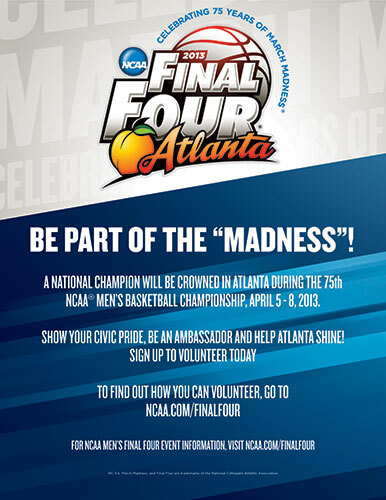 The final challenges were the launch and adoption of the NCAA’s first mobile app, and the creation and management of the first hyper-local social media campaign owned by the organizing committee. Nearly 150,000 people attended the Final Four games – making it the highest Final Four attendance to date [Dallas in 2014 surpassed Atlanta’s attendance]. More than 100,000 visitors came to Atlanta, and the economic impact was measured at $110 million (it was ~$50 million when Atlanta last hosted in 2007). Media relations resulted in 136 stories about Final Four in Atlanta totaling 97,162,830 impressions and $755,805 in corresponding advertising equivalency. 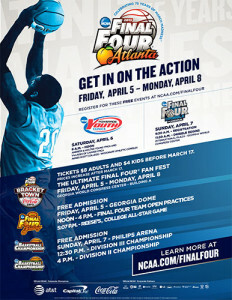 We distributed more than 20,000 pieces of collateral, and pre-sold more than 6,000 tickets to the fan festival event Bracket Town – an NCAA first. The email marketing campaigns doubled national industry standards (as reported by emailstatcenter.com) with an average open rate of 50.53 percent (vs. 23.3 percent) and an average click-through rate of 10.8 percent (vs. 5.9 percent). 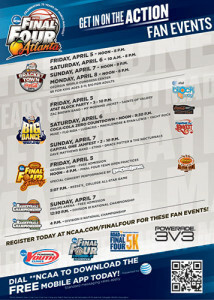 The chart illustrates all attendance figures, and we broke all event records by any other Final Four. Local Atlantans’ participation was measured at 25% through the economic impact study.